ISBN 0634004247. 9x12 inches. 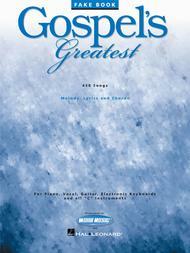 Published by Word Music and Hal Leonard Corporation. 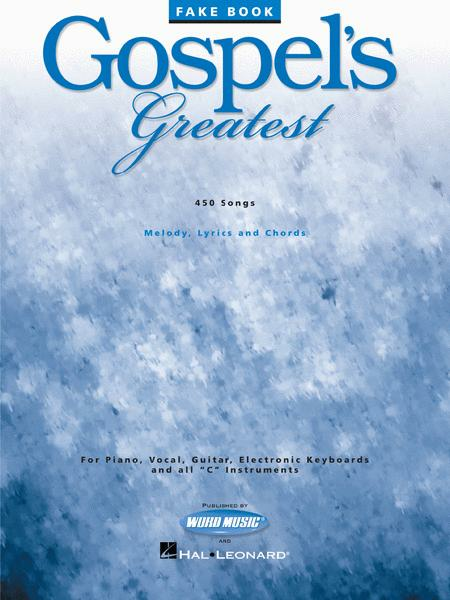 This excellent resource for Gospel titles features 449 songs, including: Amazing Grace • At the Cross • Because He Lives • Behold the Lamb • Blessed Assurance • Church in the Wildwood • The Day He Wore My Crown • Give Me That Old Time Religion • He Looked Beyond My Fault • He Touched Me • Heavenly Sunlight • His Eye Is on the Sparrow • Holy Ground • How Great Thou Art • I Bowed on My Knees and Cried Holy • I Saw the Light • I'd Rather Have Jesus • In the Garden • Joshua (Fit the Battle of Jericho) • Just a Little Talk with Jesus • Lord, I'm Coming Home • Midnight Cry • Morning Has Broken • My Tribute • Near the Cross • The Old Rugged Cross • Precious Memories • Rock of Ages • Shall We Gather at the River? • There Is Power in the Blood • We Shall Wear a Crown • What a Friend We Have in Jesus • and hundreds more!
. I then add my runs and chords as I normally do. 18 of 40 people found this review helpful. I bought this fake book of gospel music for my son, Dan. He likes everything about it--the traditional gospel songs but also the poplular inspirational songs that he has always liked. Also, the spiral binder! of missing music in our worship celebration. Thanks for the collection and scope of the book's coverage. 57 of 121 people found this review helpful. 55 of 120 people found this review helpful.